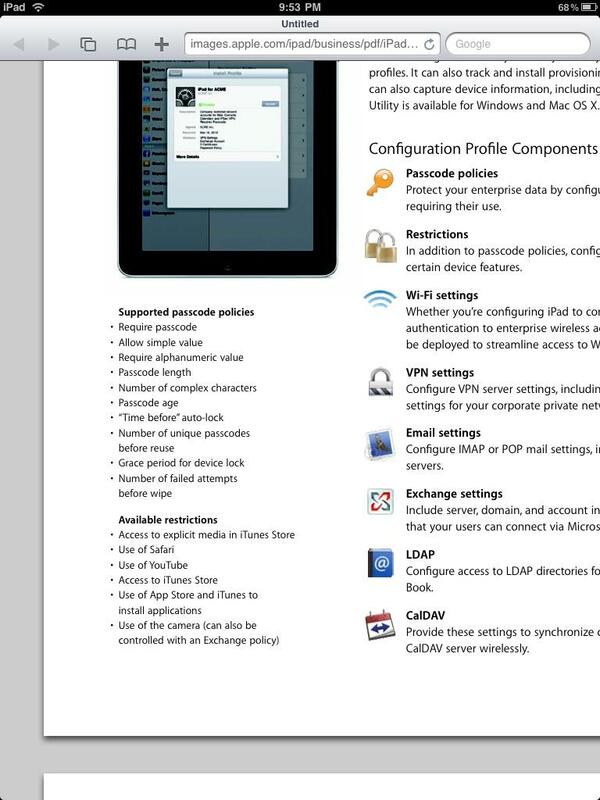 Apple's configuration profile tools for iOS devices include a variety of settings and restrictions that companies can impose to regulate how the devices are used and to configure services such as VPN and wireless networking access or email, calendar and directory services. Policies can also force strong passwords and set security features such as the number of times a password attempt can fail before the device wipes its data. Similar to parental controls, the policy settings can also be used to block access to features such as the iTunes Store, Safari, YouTube, or the use of its camera. While iPhones do have cameras to disable, no iPad models currently do. However, among the profiles specifically included in its iPad documentation, Apple notes the ability to restrict camera use on the iPad. Prior to launch, it was widely rumored that Apple's upcoming tablet might include a camera. When it shipped, Apple only provided the ability to connect to external cameras through its Dock connector, either via USB or using an SD Card reader adapter. API support for camera, flash, and zoom functions were discovered in developer builds of the iPad-only iOS 3.2 in February. While those APIs may have been added as part of software development work performed to support iPhone 4, Apple also posted job listings for a "Performance QA Engineer, iPad Media" which stated, "Build on your QA experience and knowledge of digital camera technology (still and video) to develop and maintain testing frameworks for both capture and playback pipelines." Taken together, it appears likely that future versions of iPad will incorporate a camera, most likely a front-facing unit intended to support FaceTime. That video conferencing feature is currently limited to iPhone 4, but Apple plans to make it a widespread standard among mobile devices.